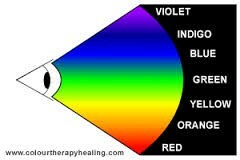 The visible light spectrum has seven different colors, red, orange, yellow, green, blue, indigo, and violet. to remember them think of ROY G BIV. 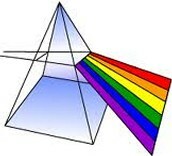 Each color of the visible spectrum is refracted a different amount. Violet light has the shortest wavelength. Red light has the longest wavelength and is refracted the least.